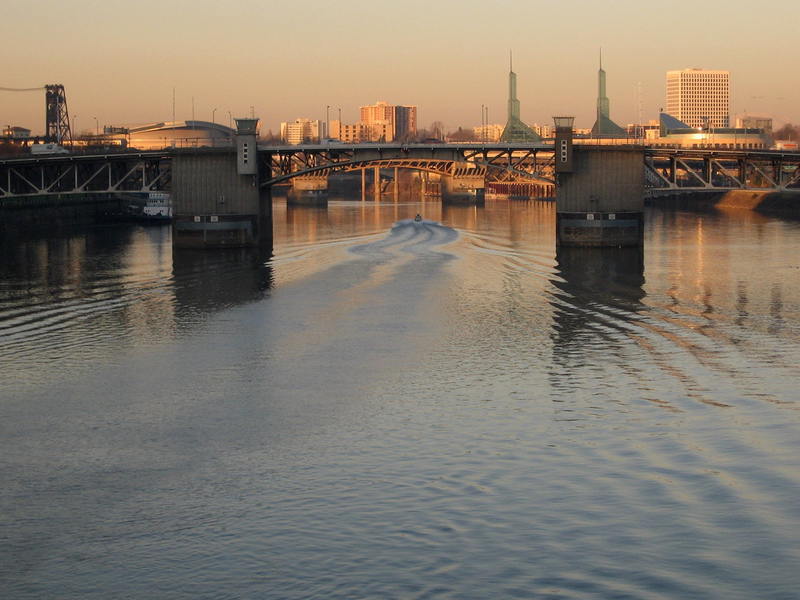 Willamette Sunset, by @brx0 on Flickr. Photo used here under Creative Commons Attribution-ShareAlike 2.0 Generic (CC BY-SA 2.0). The first Morrison Bridge opened in 1887, followed by Morrison Bridge #2 in 1905. Barriers were placed at the entrance of the latter and its draw was turned to the open position for river traffic on Saturday, May 24, 1958 as the third Morrison Bridge was dedicated and opened (The Oregonian, 25-May-1958). The Morrison Bridge main river structure consists of two 237’-9″ steel deck truss side spans and a 284′ 6″ double-leaf Chicago type bascule draw span, for a total bridge length of 760 feet. The bridge accommodates six lanes of traffic. Vertical clearance of the closed bascule span is adequate for the majority of river traffic, with openings necessary only about 30 times per month. At the dedication ceremony keynote speaker Jack Bain, Multnomah County Commission chairman, paid tribute to the workmanship and effort which went into the new project. Fellow commissioners M. James Gleason and Al Brown, and Mayor Terry D. Schrunk also made comments. At 11am, using gold scissors that afterwards were turned over the Oregon Historical Society, the commissioners’ wives snipped the ribbon. The Benson and Wilson High School marching bands, accompanied by Air Force and Marine color guards, marched from either end of the bridge to the middle, while fire boats shot huge arches of water and three Delta-winged F-102 jets from McChord Air Force Base near Tacoma roared over the city. Mr. Omer Jacobson, driving a 1920 Daniels touring sedan, gunned it to be the first one over the just opened bridge, east to west, garnering a mention in the paper, along with Ms. Catherine M. Blood in a 1955 model car, who was first across in the other direction.